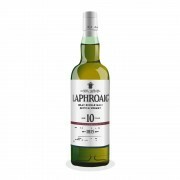 I'm sitting here waiting for my new BBQ to be delivered, so hey let's review Laphroaig 10 Year Old Cask Strength, and try it side-by-side with the standard 10 Year Old. This Cask Strength bottle is from Batch 007 and was bottled in January 2015. This bottle has been open probably for about a year. The colour is a golden yellow. The nose has those classic Laphroaig elements: wet campfire, iodine, citrus and seaweed. Linoleum. Plastic-y vinyl. Only slightly herbaceous. Very briny. With a drop of water, the malt comes through, surrounded by lemon and raspberries. I love this. On the palate we have lots of mouth-drying alcohol, with more citrus, toasted oak, sourdough and vanilla. Light caramel. Lots of prickly peat, obviously...but behind that is a lot of complexity and subtlety. Once you get past the alcohol there is a very creamy mouthfeel. Water increases the smoke, spice and creaminess. This is everything I love about scotch. The wow finish has more peat smoke, lemon curd, smoked paprika and cayenne, followed by pine and prosciutto toward the end. Of course, we all understand that reviewing whisky (like anything) is completely subjective, and so your mileage may vary depending on your tolerance for high ABV and shovelfuls of peat. But I adore this and wish I had a case (alas, this is the last dram from my bottle). The label says "We recommend that you add twice as much water as whisky to fully appreciate the taste characteristics...." Wow, that's a lot of water! That would bring the ABV down to 18.8% which, I'm sorry, I am not doing, no no no. Interestingly, the standard 10 Year Old (43% ABV) is slightly darker in colour (due to caramel colouring? ); otherwise all the other notes are simply the same but dialled down a couple of notches - which makes sense as the CS is simply undiluted standard 10 Year Old. Anyway, I love them both so much. Also, my BBQ still hasn't arrived. Laphroaig Cask Strength 10 Year Old Cask is King, Long Live Cask! A good substitute for a BBQ. I'm also surprised by how much water you say they suggest to add - each to their own. I hope you're grilling meat on your new barbie soon. @Hewie I hope so too, but the goddamn thing never showed up! Grrrrr!!!! Good to hear the quality is still there. I still have a 2005 red stripe I need to open. With the Lagavulin 12, my favorite peaters, but the 10CS is $30 cheaper. For those faithful readers who are holding their breath in suspense - the BBQ is now coming on Wed morning. The popular wisdom (i.e., unsubstantiated internet gossip) that I've always heard about the 10 CS is that it's not just the same as standard 10 without water, but that it's also made from the choice casks. So... did the Weber arrive? Several years back I compared the 10 to the CS (watered down) and found the CS was noticeably better, even diluted to about 40-45%. Best peater for the money out there. @Taco , I agree. 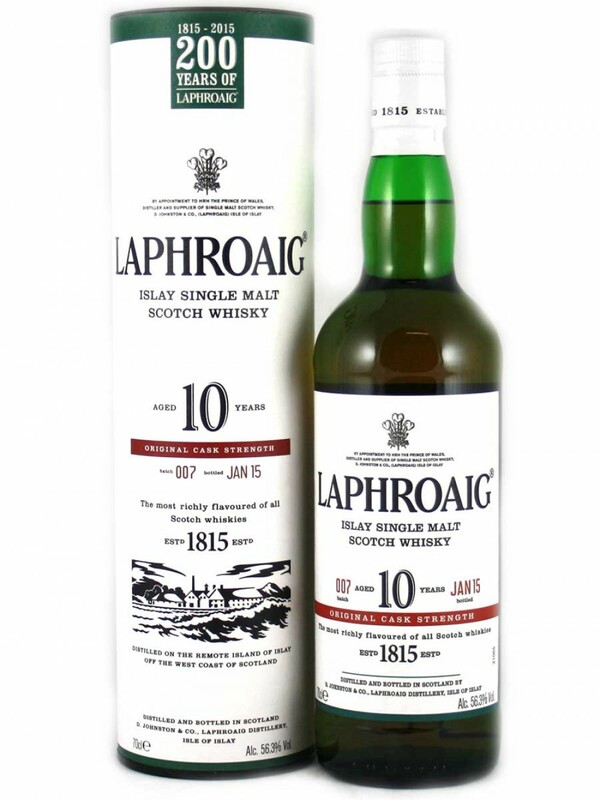 In fact, I'll go this far: All things considered—price not the least—Laphroaig 10 CS is the best damn whisky on the market. I'm sure I'm repeating myself from earlier chats, but every time I consider shelling out for a new whisky, I ask myself, "Do you really want that more than another bottle of Laphroaig 10 CS?" Many potential purchases fail to clear that hurdle. @Ol_Jas I've done side by sides with the Laphroaig 10 and the 10 CS, diluted to the same strength, and found the CS better even diluted down. Terrific whisky - one of the absolute best peaters, I agree.I have a bottle of batch 007 too and it is fabulous. A fun ride with a cigar, too, if you roll that way. @JasonHambrey Generally I find a smoky whisky with a cigar just too much smoke in my mouth - no matter how great the whisky is. I prefer a cigar with a sherried dram, or even rum or port. But hey that's just me - many people I know love to pair smoke-with-smoke! The whisky aficionado in me would say that the smoking of tobacco impairs the tastebuds and nose from appreciating the more subtle flavours in whisky. Cigar + black coffee equals YES. Cigar + whisky equals no for me. But to each his own. One of the nicest moments from back home was sitting on the back deck at my home in Alabama with a cup of black coffee on a cool summer night with a mild cigar looking at the night sky. The night sky without light pollution is the best compliment to whisky or a cigar or whatever you do to relax. so did the Weber arrive? I never met a Laphroaig 10 Cask Strength which I didn't like. I think I have tasted all of them except for the first batch and the recent Batch # 008. So far, I like this Batch # 007 the best of all. I see that @MaltActivist likes Batch # 008 even better than Batch # 007. I'll believe that only when I have tasted it...but it is something to which to look forward! My neighbour left out a bottle of Laphroaig 10 CS, 007 and a bottle of Ardbeg 10 for four of his old army buddies from Beijing to drink at his house at dinner. At the end of the meal the 10 CS was half gone, and the Ardbeg 10 was almost untouched.